This reminds me of the Sunday driving home from church….and there was Mr. Pheasant walking down the sidewalk?!! (We never have them in town.) He looked a little concerned. Your guy looks like he owns the place! Our chap flew over the hill from about two miles away where they feed them for the shoot. he never went back and who can blame him. I feel rather pleased that we have had for over a year now, and I felt it was high time he made an appearance on the blog. 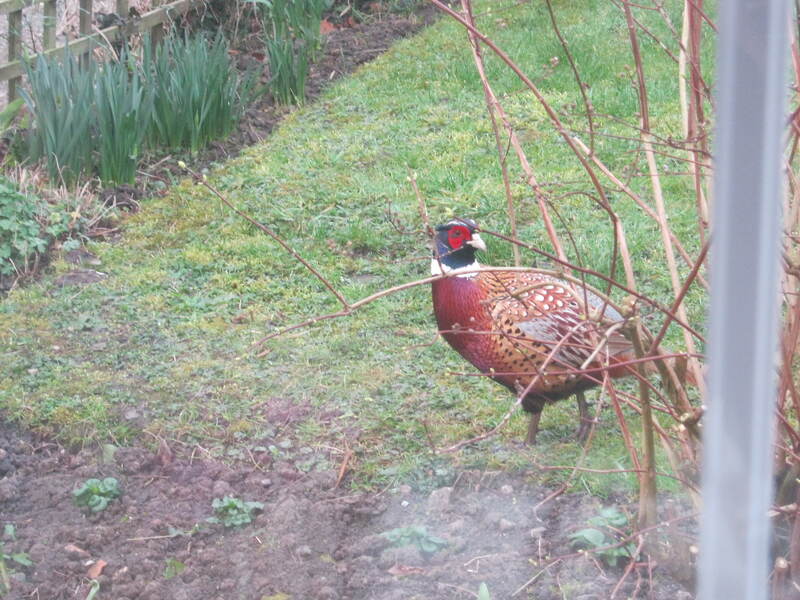 Quite, he is an escapee from the shoot that happens a couple of miles away. I worry if I miss his frequent visits because I have been out. He will have to fly back to danger territory to find one! If she’s got any sense she will! A visitor to your garden? Yes he started to visit in the Winter of 2017/2018 and has never left. I love that we saved him from the hunters. He comes several times a day to eat from the seed that drops from the bird feeders, the sparrows being rather messy.